My nerd lust for Star Wars: The Old Republic just went from 0 to 1,000 in, like, the amount of time it took me to write my own headline. This free-to-play-ish MMO from BioWare and EA will soon see the addition of an Ewok companion. Companions are computer controlled characters that aid you in your quest to rule the galaxy, or whatever. In my 30 or so hours with the game around its launch, I found myself pairing up with a wookie. That was fun. Ewoks, though? Come on, where was this when my interest in the title began to wain. 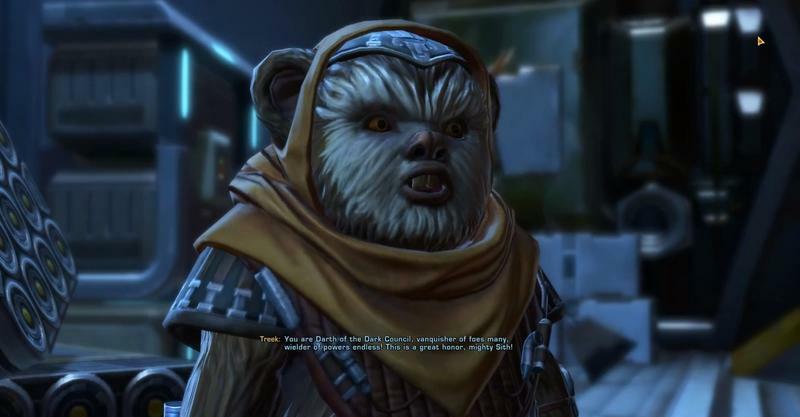 With this week's patch labelled 2.3, BioWare will add an Ewok companion to the game's selection. Treek, as he's called, is an assassin with a penchant for babbling and a profile of outstanding victories in battle. If that doesn't sell you on it, then the cutscene when you meet him will. Minor spoilers abound, of course. The bad news? I don't think free-to-play users will have access to Treek. According to the poster of the video, "Dulfy," it costs 1,000,000 credits to unlock him and you need to be a level 40 Legacy player. I turned to a good friend, Mike White, who still fires up SWTOR every now and again to explain. "As a non-subscriber, the amount of credits you can have on a character is limited to 350k. Any credits earned over that amount are stored in an escrow account that cannot be accessed unless you subscribe, essentially blocking f2p players from earning the Ewok on their own." Still, for those who actually pay for Star Wars: The Old Republic, this is an outstanding addition as far as I'm concerned.